An arrogant French general (a superb George Macready) orders his men on a suicide mission and then has the gall to try to court marshal and execute three of them for cowardice in the face of the enemy. A former lawyer turned colonel (Kirk Douglas in his prime) is the voice of reason against gross injustice. 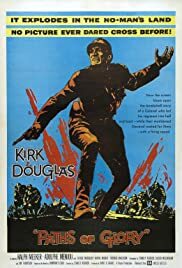 This excellently staged and wonderfully acted production is as much an acting showcase for Douglas as it is a directorial masterstroke by a young Stanley Kubrick who adapted this to the screen from a novel based on actual accounts.